ChicaCraft: Inspiration for a small Urban dwelling! Inspiration for a small Urban dwelling! Well hello! This is the first official post from my new blog ChicaCraft! I'm so excited to be joining the blogosphere of uber talented crafty women - I've been lurking for way too long! It knocked me completely sideways when I discovered this blog world. 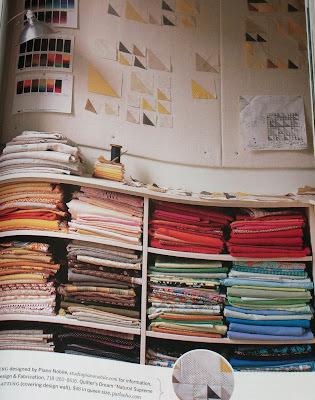 Here I was feeling like the only 30 something woman who liked to make quilts and do crafty things with my hands. I'd been searching for this community for a long time...It's funny how technology changes everything. I thought I should be able to find these people in person, where I live - but you know how hard it is too meet people in a large city. It's interesting how much more friendly and open we are on line. Can you imagine having some of these blog conversations on the bus or subway?! It would be great if we could.... Might make the world a friendlier place. 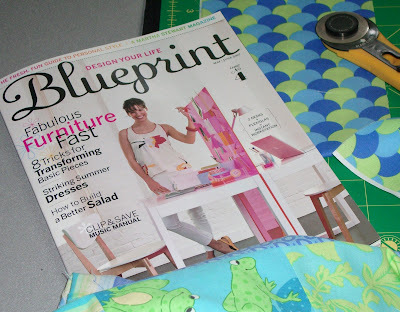 If you haven't already seen the latest copy of Blueprint Magazine, check it out! They have done a feature on Joelle Hoverson of Purl. If you don't know about her already she has two amazing stores in New York City; Purl (yarn store) and Purl Patchwork (fabric store). She also has an online store and blog. What inspired me the most were the photos of her small rental apartment. She has managed to create a beautiful living space, complete with quilting area. As an urban dweller I struggle to find room for my crafts in a 450 sq. foot apartment that I share with my husband, two cats and two bicycles! This article gave me a new resolve to keep working at my own setup.